Successful baking and pastry professionals know the secret to high quality, beautiful looking products is choosing the right tools. And the right tools for nearly every baking application are Flexipan® and Silpat®. Our rubber silicone baking moulds and mats are made with the highest quality materials and have proven to hold up to the high standards of the most demanding chefs. They can withstand use in temperatures ranging between -40°F and 480°F, and can go directly from the oven to the freezer and back again. The moulds and mats can all be reused many times, which eliminates the need for costly and wasteful parchment paper. Since these products are silicone coated, greasing is never necessary. And, of course, they are so easy to clean! • Exceptional Excursions with Flexipan-featuring chefs from around the world using Flexipan. • Choosing Flexipan-with 90 sweet and savory recipes for the artisan baker and pastry chef. We also offer sheet pans, pan extenders, stainless-steel and aluminum non-stick baguette trays and frames. 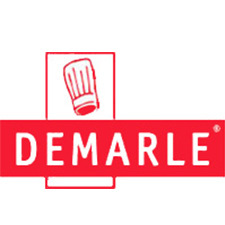 Demarle, Inc. was established in 1993 as the North American sales, marketing, and distribution center for Demarle S.A.S. The parent company was founded in France in 1965, when M. Guy Demarle produced the first non-stick rubber silicone coated baguette tray. In 1982, he developed the rubber silicone baking mat now known the world over as Silpat. Later in the 1990’s the company developed Flexipan, an incredible non-stick non-stick flexible silicone baking mould technology. In 2000, the company merged with Sasa S.A.S and is now part of the Sasa Industrie Groupe. Demarle’s mission is to be an innovative company with a priority for high quality. We utilize comprehensive quality control and R&D departments who work together to contribute to the continual improvement of existing processes & products while working with our sales team and our customers on new innovative concepts and designs.